Manufacturers including General Motors Co. and Volkswagen are poised this year to launch a flood of electric sedans, minivans and SUVs designed for Chinese tastes and budgets. Nissan, Tesla, GM and others sell imports or electrified versions of models made by Chinese partners, but the market is dominated by low-cost local rivals including BYD Auto. The Sylphy costs 166,000 yuan ($25,850) after government subsidies, or just over half the sticker price of the Chinese version of the Leaf sold by Nissan and Dongfeng’s joint venture Venucia brand. Nissan says the Sylphy can go 338 kilometers (210 miles) on a charge. “Basically, all these international giants are testing the water. They have not really launched their heavyweight models in China yet,” said industry analyst Yale Zhang of Automotive Foresight. Sales of pure-electric and gasoline-electric hybrid vehicles in the first half of 2018 rose 111.5% over a year earlier to 412,000. Total electric sales last year were 770,000. Despite official support, electrics still are a fraction of Chinese passenger vehicle sales, which totaled 11.8 million in the first half of 2019, up 4.6% from a year earlier. 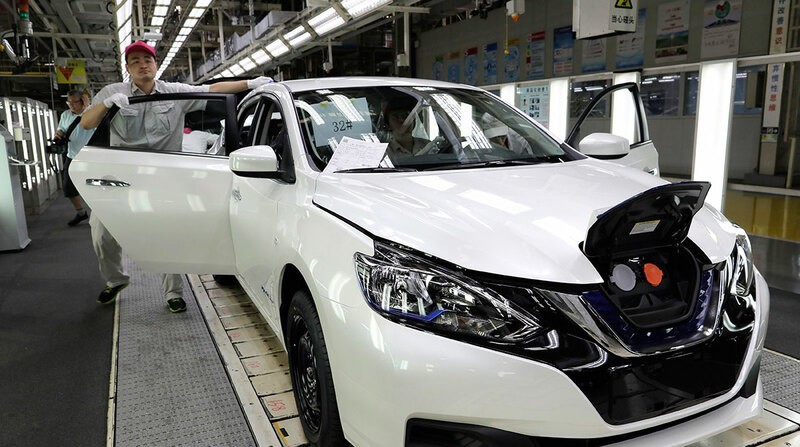 Nissan and Dongfeng announced plans in February to develop 20 electric models as part of a $10 billion, five-year investment program. They said that would include three models this year and three “affordable EV” compacts in 2019.